In this article we'll show you how you can use the W3C geolocation API to measure the speed and the heading of your car while driving. 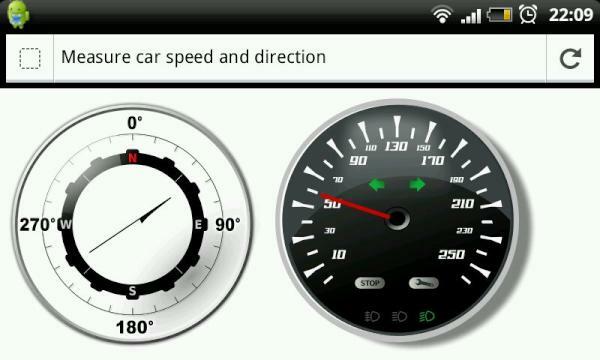 This article further uses SVG to render the speed gauge and heading compass. Here you can see two gauges. One will show the heading you're driving to, and the other shows the speed in kilometers. You can test this out yourself by using the following link: Open this in GPS enable device. Once opened the browser will probably ask you to allow access to your location. If you enable this and start moving, you'll see the two gauges move appropriately. Alter the SVG images so we can rotate the needle and add to page. We'll start with the SVG part. These are vector graphics, both created using illustrator. Before we can rotate the needles in these images we need to make a couple of small changes to the SVG code. With SVG you can apply matrix transformations to each SVG element, with this you can easily rotate, skew, scale or translate a component. Besides the matrix transformation you can also apply the rotation and translation directly using the translate and rotate keywords. In this example I've used the translaten and rotate functions directly. And with this we've got our visualization components ready. A lot of useful attributes, but we're only interested in these last two. The heading (from 0 to 360) shows the direction we're moving in, and the speed in meters per second is, as you've probably guessed, the speed we're moving at. With this piece of code, we register a callback function on the watchPosition. We also add a couple of properties to the watchPosition function. With these properties we tell the API to use GPS (enableHighAccuracy) and set some timeout and caching values. Whenever we receive an update from the API the geosuccess function is called. This function recieves a position object (shown earlier) that we use to access the speed and the heading. Based on the value of the heading and the speed we update the compass and the speedomoter. We create a custom object, currentSpeed, with a single property. This property is set to the rotate ratio that reflects the current speed. Next, this property is used in a jquery animation. Note that we stop any existing animations, should we get an update when the current animation is still running. In the step property of the animation we set the transfrom value of the SVG element. This will rotate the needle, in two seconds, from the old value to the new value. There is a smal bug I ran into with this setup. Sometimes my phone lost its GPS signal (running firefox mobile), and that stopped the dials moving. Refreshing the webpage was enough to get things started again however. I might change this to actively pull the information using the getCurrentLocation API call, to see whether that works better. Another issue is that there is no way, at least that I found, for you to disable the phone entering sleep mode from the browser. So unless you configure your phone to not go to sleep, the screen will go black. Published at DZone with permission of Jos Dirksen , DZone MVB. See the original article here.